‘Before the war he designed the now well-known Volkswagen. This was strictly a political football of the Nazi party and never did get into real mass production until after the war when it was reborn with Marshall Plan dough. During the war years, and for nearly two years afterward while the aging Doctor was in a prison camp, he kept himself alive with ideas for a real gold-plated, luxury competition Volkswagen. He knew his Volkswagen design was close to perfect for a small inexpensive car. His 50 years of engineering experience were in it and he had licked the bad characteristics that had made man-killers of his rear-engine, Grand Prix Auto-Unions, even though they were among the fastest cars ever built. The Volkswagens quickly proved themselves on these shores after they were introduced by Max Hoffman several years ago (see October 1950 MI). This was not said to impress me, it was just part of a casual bull session. George doesn’t make enough dough selling Volkswagens to pay his light bill. His take comes from the Jaguars, Rolls and other big cars he handles. But his offhand remarks were a terrific compliment to old Doc Porsche. The first Porsche to hit this country arrived a little over a year ago. Early buyers such as Thorne Donnelley and Bill Spear would spend hours bending your ear about the “super deluxe Volkswagen’s” handling qualities. Like the Volkswagen, the early Porsche had a small 1 1/10-litre engine (about 67 cubic inches), only the Porsche engine was a much more refined and expensive piece of machinery. Instead of the heavier Volkswagen block, aluminum alloy was used and this expensive type of construction was utilized throughout the whole car. Some months later, on the demand for more torque, the engine size was boosted to 1-1/3 litres (about 81 cubic inches) and today the Porsche is a full 1-1/2-litre job which makes it a baby tiger due to the car’s light weight of about 1,600 pounds. The real automotive connoisseur took to the Porsche from the opening gun although the casual sports car fan was backed off by the immodest appearing price tag. The 1-1/2 litre convertible costs approximately $4,500 and the hardtop coupe about $300 less. Of course, this is small change in the Ferrari league but it is still expensive money for a car not much bigger than the average-size bathtub. Max Hoffman, America’s largest foreign car distributor and Porsche major domo on these shores, personally demonstrated a few Porsche tricks at the Sports Car Club of America’s Equinox Hill Climb last October. Max literally creamed the boys with a stock Porsche despite the worst conditions under which such an event was ever run. Through snow and ice he beat his closest Class 4 rival by more than 18 seconds in the 2.7-mile event. Actually he made far better time than many of the bigger cars in the unrestricted class, including XK 120s and Aston-Martins. Later at Palm Beach Shores in December, Max in a competition Porsche put on the wildest driving demonstration ever seen in a road race in the U. S. Not content merely to trim the opposition, Max lapped the field and was on his way to the biggest one-sided class victory ever recorded in a sports car race when something went wrong with the cooling system air adjustment and the car was forced to retire. Though Max didn’t win this race, the connoisseurs were bug-eyed at the way the Porsche whipped by blown MGs, HRGs and their ilk. At the Vero Beach 12-hour race, two Porsche coupes gave a remarkable endurance performance. For the whole 12 hours these two 91-cubic-inch cars were right on the tail of Bill Spear and Phil Walters, who were driving a 2.3 litre Ferrari. The Porsches were pushing 100 mph on the straights consistently and at the finish they still were going as if the race had only started. There could be no doubt left in anvone’s mind after the Vero Beach clambake that Dr. Porsche had built himself one hell of an automobile just before he died. How about it, is the Porsche a good buy? From the stand- point of a true connoisseur who also has a bucket full of loose change, yes. This is a car for the guy who appreciates fine gems, paintings and the best of everything. Frankly, it doesn’t look like the price to the quick eye. There are an awful lot of good cars that can be bought for this kind of scratch. Jaguars, Cadillacs, Allards and Siatas, just to name a few. You can buy faster cars and you can certainly buy bigger cars for this money. But $4,500 won’t buy you a better car even though the Porsche has one drawback, to my way of thinking, and that’s the crash box transmission. After a few miles in the Porsche I tested, I found that with care you could handle all shifting up and down without double-clutching except to get in the lowest gears from top. It was sort of fun, as it puts the driver on his driving mettle. After a week or so, I feel even the Hydramatic kids would have the handling technique down cold, so perhaps this is only a temporary drawback for the guy who takes pride in his driving. I won’t go into the virtues of Dr. Porsche’s air-cooled pancake engine as this has already been discussed on these pages before and, besides, the name pancake engine makes my teeth chatter. In the dark days of the depression I had a job for about a year as the head auto electrician for a huge bus company. I worked from seven at night until five every morning and during the winter the company acquired a fleet of pancake buses. Many a snowy night I crawled under these things on the road when the ignition got wet and even though I had genuine built-in hair on my noggin in those days, my head felt like an ice cube most of the time. These damn engines were installed so close to the ground under the chassis that you couldn’t even wear a hat when working on them. A snow pillow, night after night in zero weather, is not McCahill’s idea of a hot time. 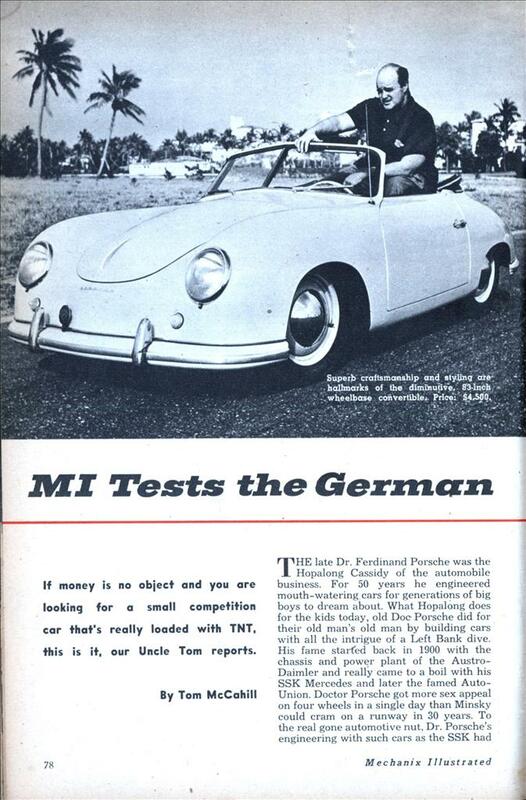 The Porsche I tested belonged to (surprise) Briggs Cunningham. 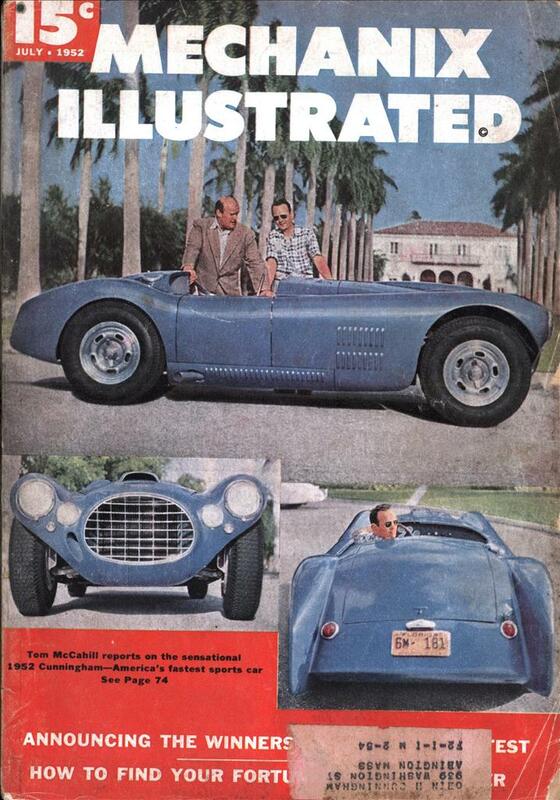 It was a well broken-in job with close to 5,000 hard miles on the clock, including a class win at Palm Beach Shores when Briggs drove it to cop the Kiwanis Trophy for cars up to 1500cc displacement. Now, the Porsche has been over here less than two years and during that time it has undergone an almost continuous series of alterations and improvements, including three changes in engine size. The very latest 114-litre Porsche has a beefed-up crankshaft, a hotter cam and additional competition refinements, including a generous chrome plating of many internal parts. The latest 1952 jobs are rated at 65 horsepower and are supposed to wind up to close to 90 in third and have a top speed in high of over 100. Briggs’ car, though only a few months old, was not that hot by a long shot but here’s bow his job shaped up. Zero to 60 took 14.6 seconds. Zero to 30 went 5.3 and zero to 50 took 9.8 seconds. Top speed on a measured mile showed 94.16. This is fantastic performance for a 91-cubic-inch engine, considering the car’s size though not its weight. The front seat is as big as my Mark VII Jag and there is loads of room for a month’s supply of clothes or three medium-sized midgets behind the seat. The big payoff comes in the way this rig handles and comers. On fast turns and bends the car remains as flat as Stalin’s head. In real right-angle stinkers, old Doc Porsche’s trailing suspension gets it around like a drunk passing a temperance meeting. As this story goes to press, the sports car characters are reasonably agog over the forthcoming debut of the new Porsche competition roadster, which will develop 75 horsepower and is supposed to hit a top speed of 106 mph. If this job is as good as it sounds, it will murder everything else in Class F, which includes the HRG, Singer, MG and all other cars displacing between 67.1 and 91.5 cubic inches. The Porsche is a car for the real fancier, the automobile man who demands the best of everything, even in small packages. It’s a car for the guy who pays $1,500 for a Purdy shotgun and $250 for a business suit. And it’s a car for the man who wants the very finest in a class or formula competition automobile. 4 cylinder, air-cooled OHV pancake-type; bore 3.2 inches, stroke 2.9 inches; brake horsepower 65 @ 4000 rpm; compression ratio 7.2 to 1. Wheelbase 83 inches; overall length 152 inches; tread 49-3/4 inches front, 49-1/4 rear; width 66 inches; height 51 inches; weight 1,600 pounds; standard tire size 5.00×16; gas tank 12 gals. 0 to 30 mph, 5.3 seconds. 0 to 50 mph 9.8 seconds . 0 to 60 mph 14.6 seconds. The trick is not to use superlatives to the extent that you run out of them. $4200, or $4500 for the ragtop. Where’s my time machine? Its apparent that the language used by auto journalists has not changed much in 60 years. If you take a look at any “enthusiast” car web site or magazine, they still read pretty much the same way. “like a drunk passing a temperance meeting” Indeed! Tom McCahill could write the most entertaining articles on cars; he managed to make technical details interesting to someone as non-mechanical minded as me. He had a real flair for writing and his reviews of a ’59 Plymouth or ’51 Ford etc. are still a pleasure to read. $4500 in 1952 is over $38,000 today. You were doing good if you made over $200 a week back then. Well Tyrebyter considering the median income was around $3,200 or $61.54 a week in 1952, a person would have been rolling in dough at $200 a week.